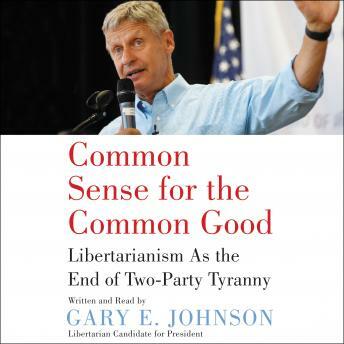 Freedom of choiceLimited government intrusion into our personal livesFree market capitalismEqualizing opportunity for allThis audiobook sets the stage for Johnson’s forthcoming book, which is part memoir and part manifesto. Here, Gary Johnson describes his own personal and political evolution. He firmly believes that, if the rigged electoral polling and debate processes were fair, the vast majority of Americans would come to understand that their beliefs and values are best represented by the Libertarian Party.